Pousada Natureza Viva is set in Cabo Frio, less than 1 km from Municipal Estadium Alair Correia and 2 km from Dunes Park. Located around 3.7 km from Forte Beach, the guest house with free WiFi is also 3.8 km away from Surf Museum. Attractions in the area include Municipal Theater, 4 km away, or Water Square, situated 4.1 km from the property. 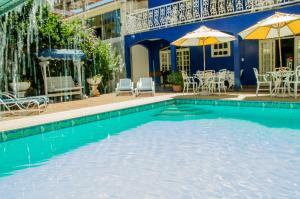 The guest house offers an outdoor pool. Handicraft Market is 4.2 km from Pousada Natureza Viva. When would you like to stay at Pousada Natureza Viva ? Each day we'll check prices and send you an email for your selected dates at Pousada Natureza Viva. If you don't have specific dates but would like to check prices for say next weekend or say next month we can check the price too. Click to write a review and share your experience of Pousada Natureza Viva with other travellers.